Half the fun of Facebook is seeing what out-there videos were shared on your News Feed, but the confines of a smartphone screen can sometimes hold things back. To help improve the 'Hey, check this out!' factor of browsing Facebook, the social media service just added the ability to take videos from your feed and blow them up on a television. 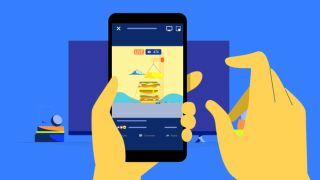 The feature lets Facebook users stream videos to a TV outfitted with Apple TV or Chromecast (or any other AirPlay or Google Cast-enabled display) with a single press of a button in the top-right corner of their video. While everything plays out, users can still browse their News Feed - allowing them to find even more videos to cast, should the initial batch of 15-second recipe guides run dry. Not only will browsing videos on the bigger screen save your buddies from having to crowd around a smaller one to see the latest cat video or Last Week Tonight blurb, but users can also see live reactions as it airs. Facebook currently has its video-casting feature rolling out for iOS and the web, with Android support for Chromecast coming soon. Should you give Facebook the boot?